KONK PACK are Thomas Lehn, Roger Turner and Tim Hodgkinson. For over fifteen years this group has amazed audiences at festivals and concerts all over the world with the sheer energy of its rapid-fire interplay, earning numerous critical accolades. 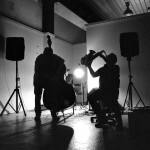 Since 1997, Konk Pack have toured regularly throughout Europe, completed three major tours of the US, and have been described by The Wire magazine’s Lee Henderson as “one of the most exciting improv groups in the world.” The group have released five compact discs, and performed at major music festivals from Vancouver to Belgrade. The musics they’ve made individually are reason enough to take note of this trio, but the music they make together leaves audiences amazed and inspired. Mike Majkowski & Jim Denley began playing together in 2002, as members of the splinter orchestra, and formed blip in 2008. they have been developing their own approach to the woodwinds/strings duo arrangement, deconstructing and reconstructing this format. 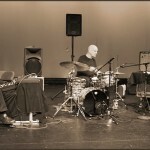 their music focuses on duration, the subtleties of sound, the pitch within timbre and texture, as well as pulse. with this they move from clear and simple structures to multi-layered complexities. they regard their work as being both composed and improvised.